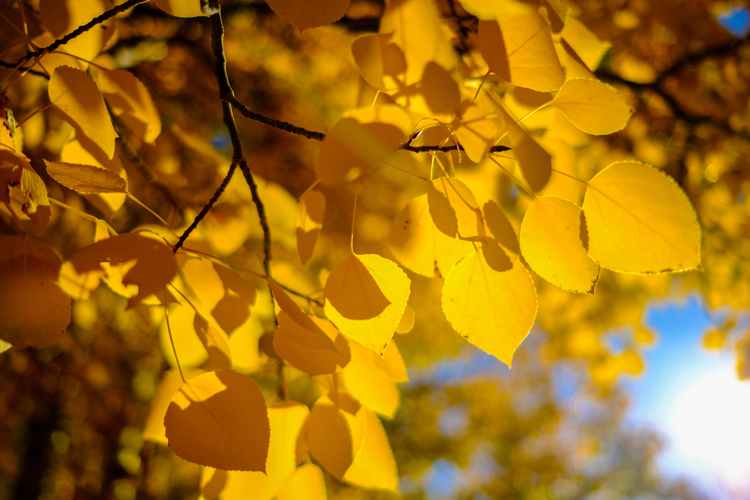 During the fall, Northern Colorado turns green and gold (and no, we’re not just talking about CSU football). 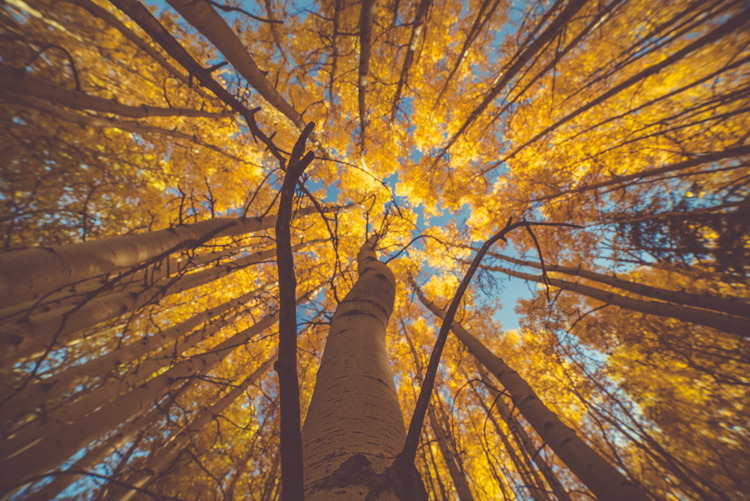 Our Colorado front range, mountain towns and open spaces are famous destinations for foliage seekers thanks to our impressive groves of aspen trees. These groves turn into glimmering and golden paradises during the fall months and there’s no better place to see them than Rocky Mountain National Park—just minutes from downtown Estes Park and an hour from Fort Collins. With variations that are dependent on the weather conditions, you can rest assured you’ll catch some gold leaf sightings beginning in mid-August, through the peak in mid-September and then dwindling through October. If you’re on the hunt for fall foliage, point your car toward Rocky Mountain National Park, leave your dog at home, and get ready for a few jaw-dropping sights! For more fall fun in and around the area, check out Colorado’s 8 Best Waterfall Hikes to Try This Fall. This short, straightforward loop around Sprague Lake is one of the best hikes for beginners in Rocky Mountain National Park—and it’s also one of the best to view fall colors. Now that’s a winning combo! While circling the water, you’ll also get to enjoy views of Longs Peak, Estes Cone and Bierstadt Moraine. This classic loop is popular amongst both view-seekers and wildlife viewers. From the Bierstadt Lake Trailhead, the climb begins steeply until you reach the top of Bierstadt Moraine. 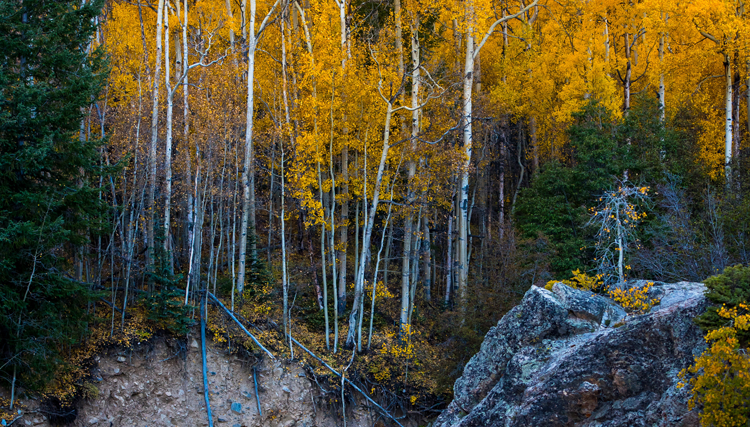 Along the way, the route is surrounded by pine and aspen groves, so the fall colors will give the eyes a real treat. From there, hikers will continue to climb at a steady incline and be rewarded with spectacular views of the mountains along the Continental Divide. Hikers in the past have seen moose wading in the lake, so keep your eyes open! Though it often feels like one of the most remote trails in Rocky Mountain National Park, Wild Basin Trail leads to some of its most stunning sights. The quick, 3.1-mile out and back route will pass Calypso Cascades, Copeland Falls and eventually lead to Ouzel Falls, the park’s famous 40-foot waterfall. Waterfalls and fall colors go together pretty well, don’t you think? This out and back hike has a steady incline the entire way which will eventually bring you to 8,773 feet in elevation and a jaw-dropping sight. Often tranquil—especially during the quieter, fall months—the route parallels Cow Creek and ends at Bridal Veil Falls, a beautiful and short cascade along the cliffs. Climbing from 9,271 feet to a whopping 11,067 feet in elevation, this challenging trail leads from wetland areas where you’ll pass Alberta Falls through mountain ecosystems where you’ll see the Loch, and up into subalpine terrain eventually ending at Sky Pond. That means you’ll get a look at three of Rocky Mountain National Park’s most impressive ecosystems, offering insights into local flora and wildlife. 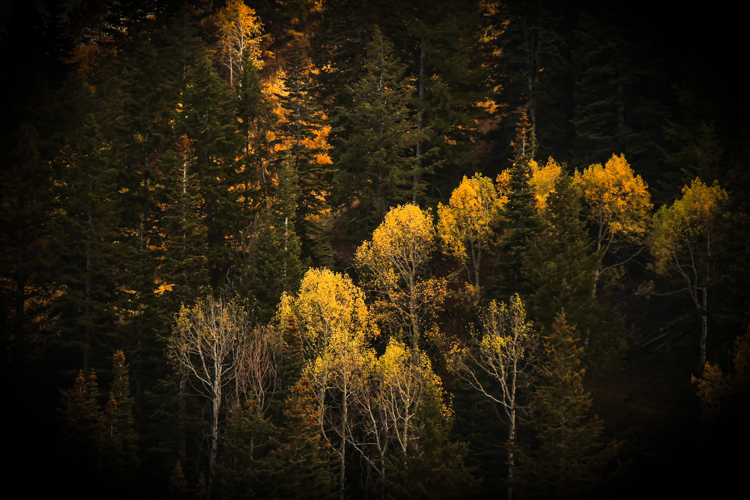 Through the mountain land, you’ll pass several groves of aspen and from above in the subalpine area, you can get a birds’ eye view of golden trees! Beginning at Lumpy Ridge Trailhead, the Gem Lake Trail covers some of Rocky Mountain National Park’s most interesting sights, astounding views and compelling history. To start out, you’ll climb portions of Lumpy Ridge, a massive granite rock outcropping that has been sculpted by wind and erosion over nearly two billion years. Along the way, you’ll also pass the historic MacGregor Ranch, views of Longs Peak and Paul Bunyan’s Boot, a huge boot-shaped rock with a hole through it. At the top, you’ll reach Gem Lake, a basin with no inlet or outlet stream that is filled with trapped snowmelt and rainwater. Thanks to Rocky Mountain National Park’s free shuttle system, this must-see trail is available as a one-way route. Begin your journey at Bear Lake and head toward Odessa Lake and Flattop Mountain. Along the way, you’ll pass four picturesque mountain lakes and Fern Falls, a jaw-dropping, 60-foot waterfall! You’ll know you’ve reached the eight-mile mark when you pass through Arch Rocks, two house-sized rocks that landed here years ago. Once you reach Fern Lake Trailhead, you can turn around to double your mileage or hop on the shuttle to get back to your car at Bear Lake. Located just 15 minutes from the heart of downtown Estes Park, this loop is one of our favorites in the area. Starting at the Deer Ridge Trailhead, the route will take you along North Deer Mountain Trail which traverses the northern flanks of the grand Deer Mountain. To loop around, you’ll climb the eastern slope of Deer Mountain, come back down the western slope and eventually return where you started at the Deer Ridge Trailhead. 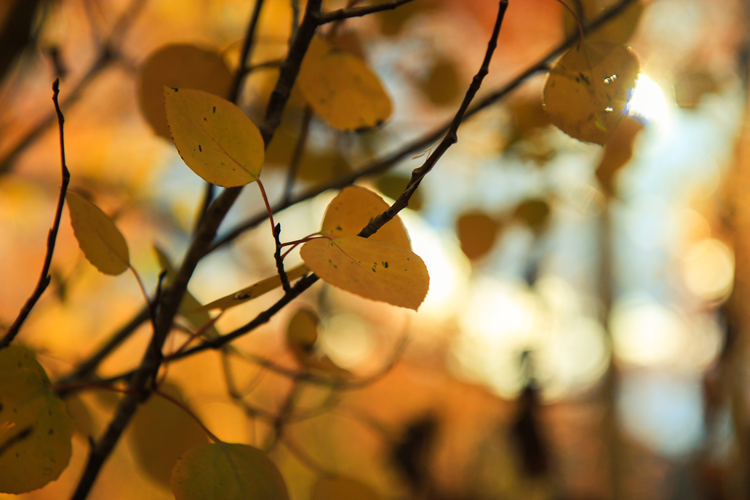 Reaching 9,922 feet at the summit of the mountain, you’ll get both an insiders look at golden aspens and a panoramic view of them spotting the park. As one of the longest day hikes in Rocky Mountain National Park, the Longs Peak Valley Loop should be reserved for experienced hikers and dedicated foliage seekers. The 23.2-mile route will take you around the valley that sits in the shadow of majestic Longs Peak. You’ll pass multiple zones, terrains, altitudes and park landmarks including Alberta Falls and Chasm Lake with the option to summit Longs Peak through the Keyhole. In the comments below, tell us all about your favorite fall hike in Rocky Mountain National Park!